SHOW JUMPING IS AN EXTREME SPORT WITH A DRESS CODE, ONE THIS GIRL DOESN'T FOLLOW . . .
JUMP GIRL is a young adult crossover novel that is clean enough for a 12+ reader and real and relatable enough for any women's fiction fan. It is the highly anticipated second book in The Go Girls Chronicles - stories of gutsy girls in action sports, by Leigh Hutton. Book one, REV GIRL, OUT NOW in eBook and paperback! 5.0 out of 5 starsBeautifully written by a brilliant story teller! JUMP GIRL leapt off the page and kept me hanging on from start to finish. I highly recommend this book to any horse or animal lover, from young (age 10-12 plus) right up to my age (I'm a Grandma!) Loads of action, adventure, drama and romance, with fabulous characters, both two legged and four. I love her Go Girls inspirational theme, especially for young girls. I can't wait to see what Leigh Hutton comes up with next! 5.0 out of 5 starsLove this book!! I could really relate to Jump Girl being a former competitive show jumper myself. I loved the action and real life conflict - once I started reading, I couldn't put it down! This is an exciting inspirational book for girls and women and not just for those who are into horses. I love Leigh Hutton's books, I can't wait for her next one! After reading the first book in the Go Girl Chronicles Rev Girl, I am hooked. I couldn't wait for Jump girl to be released and I was not disappointed. In Jump girl we meet Ebony, who has had a rough start at life, and after finally finding a stable loving home, it is torn apart by her mothers mysterious death. At least she still has her passion, Horse Jumping. Living with a gold digging aunt, it isn't surprising that she starts to get rid of Ebony's horses with no horse to ride, Ebony starts getting depressed, everything she loves is getting ripped away from her. Until one day Ebony finds Monster a fiery horse that has been left neglected and half starved, Ebony brings him back to life and with the both of them Ebony finally has a chance to realise her dreams of jumping for the World Equestrian Games. Jump girl has everything in it, mystery, murder, moments that will have you heartbroken and in tears and moments that will have you jumping for joy. Even with so many different plot themes they all tie in together perfectly. All up I would say Jump Girl is another Amazing Edition to The Go Girl Chronicles and add it as a Must Read. As an Added bonus I love how some characters from Rev Girl were added into this story tying the two together, especially Clover's Sister who I imagined a stuck up snob from Rev Girl but really enjoyed in Jump Girl. 5.0 out of 5 starsI could not put the book down. I practically read it in one sitting. 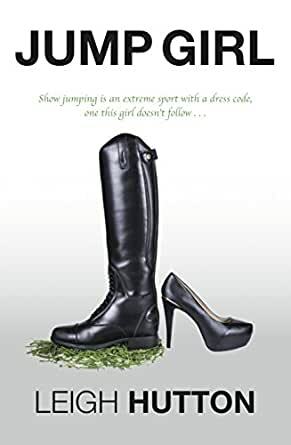 Jump Girl the second installment of the GO Girl Chronicles gives as a look into the fierce yet glamorous world that is Show Jumping, as well as; Love & Romance, Action & Adventure, Murder & Mystery, Redemption & Self Discovery, all woven together beautifully in this fast paced coming of age novel. I cannot really say much more than that without giving too much away. So go and grab your own copy and find out how amazing it is. I haven't had much experience with snow jumping or horse riding, but by the time I was finished the book I felt like I was there in front row seats to every show abs experience ebony had. What I enjoyed the most was the hope this book gives people. That no matter what happens in life if you persist and give what you love everything you can achieve so much. Ebony shows strength, determination, love, friendship, control... You must read. You will not be disappointed and by the end of the book you will feel like part of the story. Okay, so I’m torn here. On one hand, I want to discuss every aspect of this novel so I can gush about everything, but on the other hand, I don’t want to spoil anything for anyone because I want you all to go and read this book. So I’m going to keep things as spoiler-free as possible for now. During the four years I’ve been reviewing books, I’ve not once encountered a story based around show jumping. So, needless to say, I was intrigued and excited by getting to reading something completely new to me. And after reading Rev Girl, I had high hopes for another fantastic story. What can I say about Ebony Scott Harris, our fabulous protagonist of Jump Girl? She’s pretty much everything you want in a lead character. She’s feisty, has attitude, she’s courageous, and she has a fierce passion for her horses. The emotion she showed throughout the story, especially during the high and lows of competing, was honest and believable. I adored every scene between Ebony and her horses. The love she had for them and the lengths she’d go to protect them was truly heart-warming. I felt the strong bond she had with her horse, Monster, and it gave me a new appreciation for the special relationship that forms between a horse and their rider. The story also gave me an insight into a world I knew very little about. As with any sport, there are lies and manipulation around every corner. Some parts of this story truly broke my heart because it forces you to think about the similar situations that actually do occur in real life. But of course, there were also plenty of happy and light-hearted times. Ebony gets to meet some wonderful people and make such great friends. As competitive as the sport may be, it also proves that life-long bonds can, and often do, come from it also. I loved having some of the characters from Rev Girl play a bigger part in this book, especially Dallas. I didn’t really warm to him in the first story, and I wasn’t bothered about what happened to him in the end. But this time around, he had wonderful character development and I got to see a whole different side of him. Ebony was definitely a better match for him than Clover had been. I also adored Clover’s sister, Jazz, being added to this story. All of the new characters we get to meet are also brilliantly written, even the not-so-nice ones, like Annika. What I expected in this story was drama and action, which I got plenty of, but what I didn’t expect was the mystery element. And it worked brilliantly. This really is one of those rare books that manage to scratch upon every genre: action, adventure, romance, drama, and even a thrilling mystery. Just a fair warning to you all, you may not want to read this book whilst on public transport. One time, I very almost missed my stop because I got too hooked into the story. Then I had the misfortune of reading a certain scene towards the end whilst I was on an extremely busy train, and I had to stop reading so that I wouldn’t end up crying in public. Despite the lows that Ebony has faced throughout her life, her story is definitely one of hope. Fictional it may be, but there are real situations like hers, and more than anything, this book proves that you can make your own success with enough determination. I could talk on for hours about everything I haven’t already spoken of, but like I said earlier, I’d rather not spoil anything! Instead, you should just make sure you add this book to your reading pile so you can discover Ebony’s story for yourself. This book will take you on an emotional roller-coaster. You’ll fall in love, you’ll have your heart ripped out, and then you’ll have it mended again. And stories like that stay with you for a long time.